If you have ever had a tattoo, you know the types of questions that people often ask. First, people tend to ask you what it means or why you got it. This is a common, easy questions to answer, so you can typically give your standard response and move on. Unfortunately, there are some people out there who absolutely hate tattoos. These people like to ask you what is going to happen when you get old. They tell you that your skin will sag, the color will fade and the tattoo will start to blur. Over time, your body actually will break down some of the pigment, so your tattoo would actually start to fade over the years. This process happens so slowly that you will not even realize that it has occurred until decades later when you look down and realize that your tattoo has finally started to age. In reality, this type of problem is far less important than most people seem to think. Blurring and fading are easily fixed problems. You got a tattoo at a tattoo parlor, so there is no reason that you can’t return for a touch up to make it look as good as new. If you take care of your skin, sagging will be less of an issue. Another way around this problem is to just wait until you are older to get a tattoo. After all, you will already know which parts of your skin have managed to stay pliable and healthy over the years. Plus, you do not have to worry about half a century passing between when you get a tattoo and when it starts to fade. You can be the hip grandmother or grandfather with the later-life crisis. Whatever you choose to do, keep in mind that it really is not as much of a problem as people tend to think. 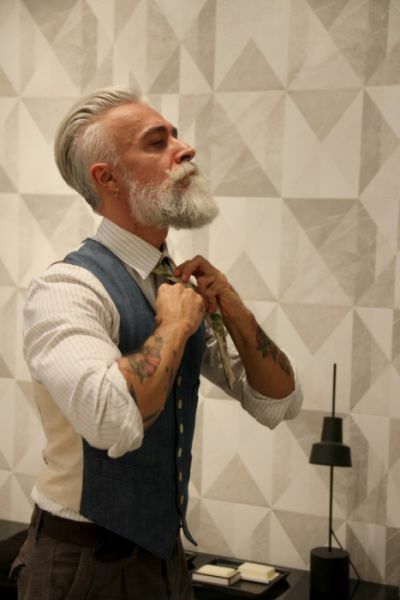 There are plenty of old people with tattoos now, and that number is only going to grow in the coming decades as the current generations age. You will be in good company. Anyone can have tattoos at any age. Other than getting touch ups to your tattoo, there are a few ways to make sure that your tattoo will always looks it best. Like anything involving your body, good health, a balanced diet and the right care can ensure that your tattoo is shining brightly even when you are far past retirement age. This is the biggest argument against tattoo naysayers. You paid to get your tattoo, so why can’t you get a tough up when you need it? The color can be refreshed every so often so that it continues to be vivid, bright and vibrant. Plus, you can adjust the outline to make sure that the image remains clear. Your tattoo’s color does not have to remain the same forever because touch ups only take a little while to do to make your tattoo look great again. Unsurprisingly, smoking and tanning are not good for your tattoo. Basically, any activity, food or drink that can cause premature aging is a bad idea if you want your tattoo to keep looking great. Other than avoiding tanning beds, you should also wear sun block when you are outside to prevent the sun from damaging your skin. Stick to chemical-free sun block for the best results. You should also avoid drinking alcohol, smoking and drugs so that your body does not age faster than normal. Exfoliation is the first step toward beautiful skin because it helps to remove dead skin cells that would hide your tattoo or blur the edges. You should also use the right moisturizer so that the skin around the tattoo remains looking young and supple. If you want to go the natural approach, coconut oil is a safe, effective moisturizer that makes your skin look great. If you want to age beautifully, you need to exercise regularly and make sure that you eat a balanced diet. Antioxidants found in vegetables and fruit can help to slow down the effects of aging. Activities like yoga or swimming are also great for keeping your body in shape without putting undue pressure on your joints. You do not have to be model-thin to have a good body shape. Get to a healthy weight and stick to it. If you gain or lose a bunch of weight, it will end up causing sagging and stretching on your skin. This can obviously impact the way your tattoo looks, so it is best to get to a healthy, natural weight and stick to it. There are certain areas of your body do not age quite as well as other sections of your body. As a rule, your bikini area, breasts, buttocks, lower back, elbows, knees and hands are more likely to age or develop sagging skin. If you get your tattoo somewhere else, you will automatically have less to worry about. Next articleWhen Does the Placenta Take Over?